Global medical foods market size is estimated to be valued at USD 11.1 Billion in 2018 and will register a CAGR of 5.1% to create high collective revenue opportunity for industry players. The industry has grown manifolds in last two decades, with most of the growth folding post 2010. Healthcare expenditure has increased not only in developed economies but also developing regions. Moreover, the in-patient to outpatient ratio has almost doubled in last two decades. As such, the industry holds immense potential for companies to capitalize. Various big companies along with emerging entrants are making foray in the market with different go-to-market strategies. Cutthroat competition has led the industry players to op for personalized solution. This helps companies to target their product efficiently across the clients. For instance, while Axona helps patients Alzheimer’s disease, Deplin of Pamlab acts as an adjunctive therapy for depression. Many companies are emerging in medical foods market with different products. Nowadays, medical foods are available as capsule and tablet form. Furthermore, few companies are leveraging online sales channel to boost their sales volume. This is in line to industry trends shifting towards digital healthcare space. Online distribution mode has not only helped industry players to generate 1.8X higher sales, but also helping in setting up brand name among end-use consumers. Early entrants are expected to create higher opportunity. Increase in medical foods market revenue is attributed directly to rising geriatrics population and personalized medicine. As of 2017, personalized medicine is valued at USD 120 billion and will partially grow by 5% annually. These factors are expected to create revenue opportunity for industry players. Also, point of care is higher in aging population wherein chronic diseases affect most. Over 80% of people aged 65+ suffers from atleast one chronic illness. Hypertension accounts for over half of the chronic illness. Changing lifestyle is further adding up complications to the life. As such, there is high demand for effective treatment and preventative measures. In 2017, Ajinomoto acquired equity position in Cambrooke Therapeutics Inc., to broaden the medical foods product portfolio. In 2017, NattoPharma entered in partnership with Biolab Farmaceutica for commercialization of MenaQ7 Vitamin K2 in Brazil and neighboring countries. In March 2017, BASF partnered with DIEM Labs in order to distribute BASF’s first line of medical food products for patients with NAFLD. By disease indication, much of the demand is expected to generate from diabetic neuropathy. As per the estimates, diabetic neuropathy and ADHD are estimated to collectively account for 47% in 2017. Some of the key medical foods for diabetic neuropathy are Foltanx, Percura capsules, and METANX. While diabetic neuropathy will lose market share by 29 basis points, depression segment is expected to register highest increase in market share by 165 points. Competition is very high owing to which companies are trying to capitalize new business segment. Successful product level strategy could help companies to gain competitive advantage. There exist high industry opportunity in eating disorder segment. It is expected to grow by 1.9X to create revenue opportunity bracket of USD 606 Million during the forecast period. Compared to other areas, eating disorder is characterized by presence of few players – thus lower competitive index and higher profit margins. However, the scenario differs from players to players. Globally, North America and Western Europe collectively accounted for 64% of the global medical foods market revenue. The industry in these developed regions is growing at a percent higher than GDP growth rate. While collectively healthcare spending cedes to just 2% in these regions, medical foods market is registering a strong growth of above 3.5% annually. Well established healthcare amenities along with potential end-users and higher healthcare spending are expected to create favorable ecosystem for industry players. It is because of this that many industry giants are trying to either strengthen their market share or enter in the region. Various product and partnership level strategies took place in the region in last few years. Recently, in November 2017, – Ajinomoto Co., Inc. (“Ajinomoto Co.”) has acquired an equity position in U.S. medical foods company Cambrooke Therapeutics, Inc. for nearly USD 64 million. Similar such moves have been seen in 2010 and 2012. As such, it is expected that companies are highly focused towards capturing a major chunk of developed regions. In Asia Pacific, Japan account for over half of the regional share. It accounted for 52% regional share in 2016. Unlike other counties in Asia Pacific, medical foods market is regulated in Japan – and thus is well established with global players operating in the country. In other parts of Asia Pacific, drug based therapies still holds the majority of market share. Medical nutrition will take time to gain foothold in the region. Though the region has high addressable market and could easily create revenue opportunity higher than North America and Europe combined. However, the key challenge exists in physicians’ lower awareness about medical nutrition benefits. The global medical foods market outlook is highly consolidated with nearly 60 key players engaged in the industry. Some of the key medical foods market players are Abbott, Danone, Primus Pharmaceuticals, XYMOGEN, Targeted Medical Pharma Inc., Nestlé, Mead-Johnson, and Fresenius Kabi AG. The companies are focused not only on product level strategies but also distribution channel. The main distribution points for these companies include dietitians, physicians, drug specialists, and prescribing nurses. Slowly, market is shifting towards online sales channel. Industry giants are trying to capitalize potential market of China and India – to assure long term revenue sustainability. Various developments were noted since 2010. Most recently, in 2017, BASF entered in agreement with DIEM Labs LLC to commercialize its first U.S. medical food products for Non-Alcoholic Fatty Liver Disease (NAFLD) patients. In 2013, Nestle acquired Pam Labs and made equity investment in Accera in 2012. Similar such initiatives are expected to be seen over the forecast period. Global Medical foods market size is estimated to register a CAGR 5.1% during the forecast period to create a revenue opportunity of USD 7.1 billion over the forecast period. The industry is consolidated with leading players accounting for over 84% of global revenue share. Favorable government policies and product innovation is creating white spaces for industry players. Bekryl has been conducting in-depth research on medical foods industry since 2015, thereby offering most detailed strategic information on the industry. The recently updated report identifies global market size, key drivers, challenges and market strategies of key medical foods market players. 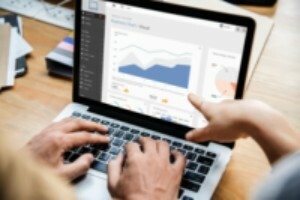 In order to prepare historical data and analyze Medical Foods market forecast, Bekryl prepare data for product supply and actual demand from end-use consumers including physicians and other healthcare specialists and dietitians. Through this, we get to know actual demand for Medical Foods market globally. The data collection is done through secondary and primary market research and then a constructive model is developed. With the model constructed, the cluttered data collected through different sources is structured with the help of proprietary analytical tools – making us understand the variation happened in the current year compared to historical years. 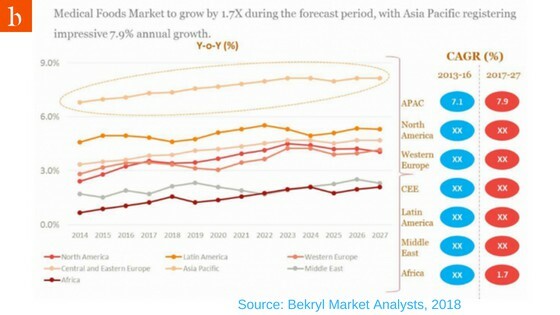 To forecast Medical Foods industry revenue, Bekryl Market Analysts takes in consideration the demand growth of the segments. Demand for the product is dependent on end-user spending which is a function of many factors: amongst them macroeconomic strength, price variation and other base factors. The forecast methodology requires extensive data analysis across countries. Among all the factors, GVA and GDP output is considered as the first set of approximation. Bekryl Market Analysts has developed a demand driven model based on GDP across targeted countries. Under this, co-relation is analyzed between product and GDP – resulting in a constant GDP-Product coefficient. Higher the coefficient- greater will be the growth rate. For instance, GDP-Product segment coefficient matrix of 3 denotes Medical Foods industry growth is nearly 3.5X to 5.5X higher than the relative GDP. Thank you for choosing Bekryl. Please provide us the necessary details to receive sample copy.